Whoever saw a pot of hot oil and decided to dunk a chicken in there for the first time – thank you. Fried chicken is one of the most delicious things on the planet, and the fact that it’s found everywhere from the US to Asia proves its worldwide appeal. 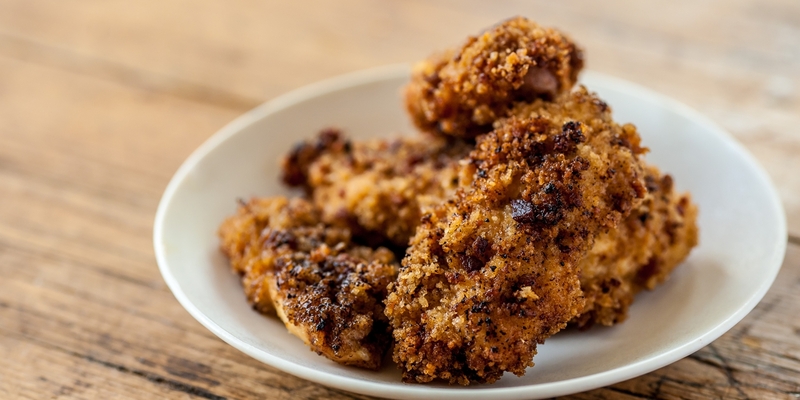 Our collection of fried chicken recipes shows just how versatile this seemingly simple dish can be. For fried chicken in its most universally loved form, try Shaun Hill’s Southern fried chicken recipe. Looking for something that can feed a crowd? Marcus Wareing’s Crispy chicken canapés will be gobbled up in an instant. Korean fried chicken has risen to the fore in recent years thanks to its shatteringly crisp coating, and it’s just as popular in Japan – just take a look at Scott Hallsworth’s Crunchy chicken karaage steamed buns to find out why. Finally, if you fancy getting all, well, fancy with your fried chicken, upgrade your bird and cook Food Urchin’s Deep-fried poussin with tarragon mayonnaise and potato wedges. Fried chicken is one of those things that are simple to cook but difficult to master, so play around with different brines, marinades, ingredients and spices to get it just perfect for your own palate. Take a look at our guide on How to joint a chicken if you want to minimise waste.